The composite combines nanolayers of a ceramic called aluminum oxide with graphene, which is an extremely thin sheet of carbon. Although both the ceramic and graphene are brittle, the new metamaterial has a honeycomb microstructure that provides super-elasticity and structural robustness. Metamaterials are engineered with features, patterns or elements on the scale of nanometers, or billionths of a meter, providing new properties for various potential applications. 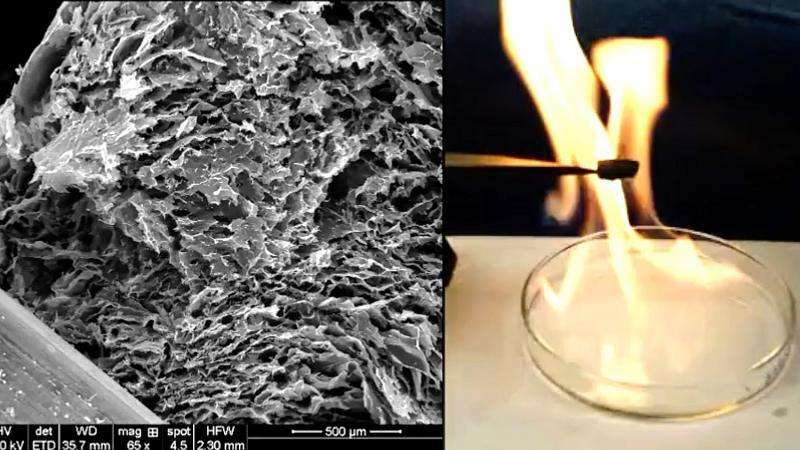 Graphene would ordinarily degrade when exposed to high temperature, but the ceramic imparts high heat tolerance and flame-resistance, properties that might be useful as a heat shield for aircraft. The light weight, high-strength and shock-absorbing properties could make the composite a good substrate material for flexible electronic devices and "large strain sensors." Because it has high electrical conductivity and yet is an excellent thermal insulator, it might be used as a flame-retardant, thermally insulating coating, as well as sensors and devices that convert heat into electricity, said Gary Cheng, an associate professor in the School of Industrial Engineering at Purdue University. "This material is lighter than a feather," he said. "The density is really low. It has a very high strength-to-weight ratio." Findings were detailed in a research paper published on May 29 in the journal Advanced Materials. The paper was a collaboration between Purdue, Lanzhou University and the Harbin Institute of Technology, both in China, and the U.S. Air Force Research Laboratory. A research highlight about the work appeared in the journal Nature Research Materials. "The outstanding properties of today's ceramic-based components have been used to enable many multifunctional applications, including thermal protective skins, intelligent sensors, electromagnetic wave absorption and anticorrosion coatings," Cheng said. "Here, we report a multifunctional ceramic-graphene metamaterial with microstructure-derived super-elasticity and structural robustness," Cheng said. "We achieved this by designing a hierarchical honeycomb microstructure assembled with multi-nanolayer cellular walls serving as basic elastic units. This metamaterial demonstrates a sequence of multifunctional properties simultaneously that have not been reported for ceramics and ceramics–matrix–composite structures." "We carefully control the geometry of this graphene aerogel," he said. "And then we deposit very thin layers of the ceramic. The mechanical property of this aerogel is multifunctional, which is very important. This work has the potential of making graphene a more functional material." The process might be scaled up for industrial manufacturing, he said. Future work will include research to enhance the material's properties, possibly by changing its crystalline structure, scaling up the process for manufacturing and controlling the microstructure to tune material properties.